A crown, which is the source of magic, has been stolen from the Equestria world. The kingdom is powerless without it, which is why its princess, Twilight Sparkle, goes to the human world to get the crown back. During the journey, she turns into a young human girl. She meets her Equestria friends at Canterlot High School. Together they want to try and get the crown back to save both the Equestria kingdom and the human world. 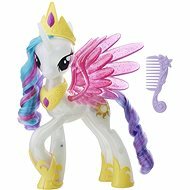 Equestria Girls dolls come equipped with many stylish accessories — fashion accessories, instruments, tools for everyday life and pet friends. You can dress them, get them ready for a concert or take up new hobbies with them. They will keep any little girl engaged for hours. Twilight Sparkle is an enthusiastic book lover. She is clever, curious and can do magic. Rainbow Dash is confident, energetic and a devoted friend. She loves to chat with her friends. Rarity loves fashion and designs models for her and her friends. Pinkie Pie is very energetic. She loves to smile and have fun. Fluttershy is quiet and shy but she is also very friendly. 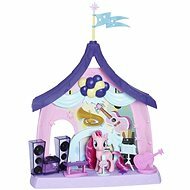 Fluttershy plays the tambourine in a band. Applejack is an honest, reliable girl.